Ages past, the mountains south of the great jungle had represented the limits of civilization. The elemental powers which had raged there – mighty storms, earthquakes, volcanoes, and more, had made the land a haven for a few wandering, primitive, tribes. Those had survived by appeasing the elemental powers, their shamans offering them worship and sacrifice. In some cases that had included the sacrifice of members of the tribe. “Throwing Virgins into the Volcano” may be a bit of a cliche, but desperate people often reach for cliches. Naturally enough, the choice often fell upon the defenseless – outlaws, offenders against the tribe, and unwanted or orphaned youngsters. One such youngster turned out to be an orphan after all – and her father, when he returned from an adventure carrying the cursed Dagger of Transmigration was not pleased. Using the dagger he killed the tribal shaman and his two apprentices, stealing their powers at the cost of his sanity, and – in grief and madness – flung himself into the lava lake as well. With the cursed dagger, his own rage, and the powers of three shaman to call upon, he won – and stole the mountain-spirits power as well. The eruption raged for weeks, wiping out the surrounding area, and the tribe which had slain the last of his family, before he, unused to the elemental powers which were now his, slept. While he slept, other tribes sent shaman of their own – who sealed the slumbering spirit of fire and rage in it’s slumber, hopefully forever. As the elemental storms passed into a cycle of peace, civilization spread into the area. The old ways, and the rituals of the shamans, passed into history. Driven by buried anger and hatred, the spirit of rage and fire is waking, long centuries before the elemental cycle would turn naturally. 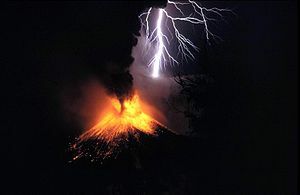 It is raging forth across the land, striking at the temples of the civilized gods – opening volcanic vents into them and flooding them with magma. The gods will not interfere; the elements of the world-spine are not part of their dominion, and men must deal with what men have wrought. Otherwise, as the other elemental spirits, unnaturally disturbed, awaken before their time, civilization will once more be driven back. The world will endure – but millions will perish.